The US has raised concerns with Rwandan officials over reports suggesting it is involved in "destabilising activities" in neighbouring Burundi, officials have said. Rwanda is reported to have armed and trained refugees to fight on behalf of the Burundian opposition. Rwanda's government has denied similar allegations in the past. Burundi has been hit by civil conflict since President Pierre Nkurunziza decided to stand for a third term. Has African Union let down Burundi? In a hearing in the US Senate Foreign Relations Committee, two top diplomats cited reports from colleagues in the field that they said pointed to Rwandan involvement in the Burundi crisis. Thomas Perriello, US envoy for the Great Lakes region of Africa, said the reports suggested that Burundian refugees, including children, were being recruited from camps in Rwanda to participate in armed attacks against the Burundian government. Burundi's Foreign Minister Alain Nyamitwe welcomed the statements, saying they were "better later than never because we've been telling the Obama administration about this for the last seven or eight months," Voice of America reports. He also urged the US "to move beyond simple rhetoric and take action", without giving further details. Turmoil erupted in Burundi after Mr Nkurunziza announced plans last April to run for a third term, which he went on to win. More than 400 people have died in the violence and at least 240,000 have fled the country. Linda Thomas-Greenfield, US assistant secretary of African affairs, said that US officials had encouraged Rwandan authorities "to play a productive role and not to do anything that might further destabilise Burundi". The governments of Rwanda and Burundi are from rival ethnic groups and there is growing international concern that another ethnic conflict could take root in the region. Last week, a UN panel reported that Burundian refugees had been recruited at a refugee camp in eastern Rwanda in May and June 2015, and given two months of military training. At the time, Ms Mushikiwabo described the allegations as "unfounded". April 2015: Protests erupt after President Pierre Nkurunziza announces he will seek a third term in office. May 2015: Constitutional court rules in favour of Mr Nkurunziza, amid reports of judges being intimidated. 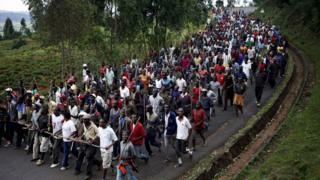 Tens of thousands flee violence amid protests. May 2015: Army officers launch a coup attempt, which fails. July 2015: Elections are held, with Mr Nkurunziza re-elected. The polls are disputed, with opposition leader Agathon Rwasa describing them as "a joke"
November 2015: Burundi government gives those opposing President Nkurunziza's third term five days to surrender their weapons ahead of a promised crackdown. November 2015: UN warns it is less equipped to deal with violence in Burundi than it was for the Rwandan genocide. December 2015: 87 people killed on one day as soldiers respond to an attack on military sites in Bujumbura. Is Burundi on the verge of return to ethnic conflict?